Step 1 In a small sauce pot, heat the stock over medium heat. Step 3 Once the stock is simmering, slowly pour about ¼ of the stock (while whisking) into the eggs. Step 4 Place the sauce pot back over the heat and pour the egg mixture into the stock (again, while whisking). Step 5 Turn the heat down to low. Whisk the soup on and off, for about 2 minutes, letting the soup thicken slightly. Cheap and easy. Sounds like a pay-per-view movie title. I’m talking about a five minute meal that costs less than five dollars to make. The best of both worlds, ya? 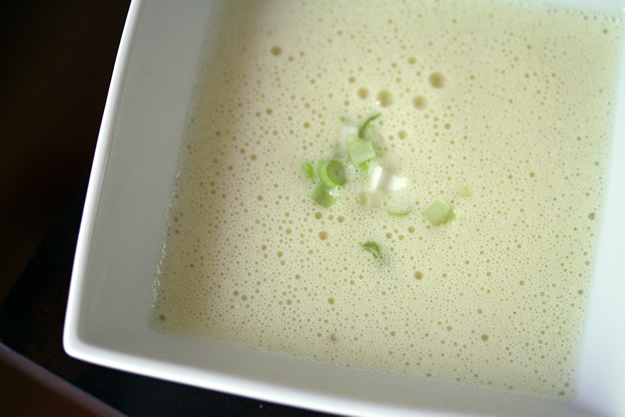 This is a simple riff on the classic egg drop soup, which is an equally cheap and easy soup to make. My version really just mixes up the method, so the soup consistency is smooth, velvety and slightly more elegant, but not in a snobby way.